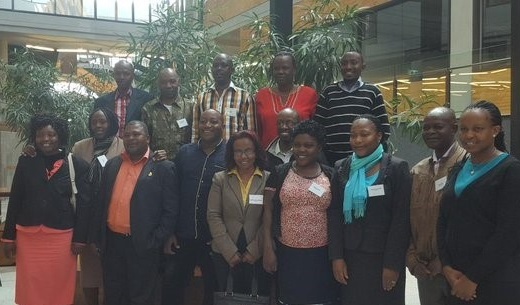 As previously reported, the Crawford Fund is part of the Australia-Africa Plant Biosecurity Partnership, which is training a set of Biosecurity Fellows or ‘champions’ who will be the first members of the Africa Plant Biosecurity Network. The network aims to improve plant biosecurity and safe trade of agricultural products in ten east and southern African countries: Burundi, Ethiopia, Kenya, Malawi, Mozambique, Rwanda, Tanzania, Uganda, Zambia and Zimbabwe. As reported in the release announcing the arrival of the Fellows (pictured below), the six weeks in Australia will include individual three week placements with a range of State and Federal Governments, and biosecurity research organisations around Australia. The Fellows will spend some of this time working with their host agencies on priority African plant pest and disease issues. For example, three plant biosecurity managers from Africa are working with leading Australian researchers to combat the invasive fruit fly in Burundi, Mozambique and Tanzania. “These countries are highly dependent on agriculture, making fruit fly very damaging not only for trade but also for food security,” said Dr Michael Robinson, CEO of Australia’s Plant Biosecurity Cooperative Research Centre (PBCRC). Epitace Bizimungu, Armando Marcos Come and Katemani Mdili will be spending three weeks researching key management aspects of the fruit fly, in areas of biology, market access, monitoring and control. All fifteen Fellows will also go through communication and other soft-skills training provided by the Crawford Fund, with Econnect Communication who works with the Fund on our Master Classes in Communicating Research to Stakeholders. You can learn more about each of the champions here. The Australia-Africa Plant Biosecurity Partnership is funded by the Australian International Food Security Research Centre (AIFSRC), within the Australian Centre for International Agricultural Research (ACIAR). The program is being delivered by a consortium of: Plant Biosecurity CRC (PBCRC), ACIAR, Centre for Agriculture and Biosciences International (CABI), CSIRO and the Crawford Fund.